Registration is open for Lemongrass Spa consultants ONLY (if you can't verify your rep ID, payment will be refunded, and enrollment denied). Want to learn about the specific essential oil, blends, and products containing essential oils that Lemongrass Spa offers? Then enroll today! 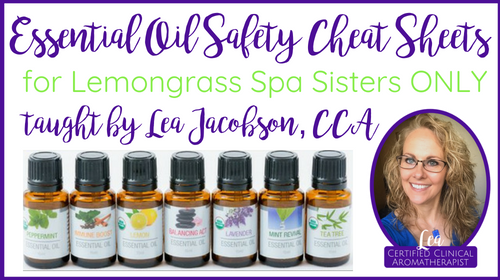 Enrollment includes access to the Essential Oil Safety Cheat Sheets FB group for Lemongrass Spa consultants. downloadable PDF profiles of all essential oils and blends Lemongrass Spa offers - including new ones! You can feel free to download and print the information in this group to present at your parties. Remember - knowledge is power - and the more you know, the better position you are in to help others. Typically, for this sort of biz coaching, people pay me $150/hr. If you spend just one hour in the group, that would cost you $7,800/year! This access is a steal - and an asset to your business. WELCOME to Lemongrass Spa Essential Oil Expert Training!